WILLIAM ARSCOTT’s early life has all the drama and pathos of a Dickens novel. He was born in 1724 in the village of Dunsford in the Teign valley. Here the river flows out of a wooded gorge, ‘a crystal stream abounding with trout’. William was descended from two well-established Dunsford families, a single line on his father’s side and a much more extended clan on his mother’s. He was the third son of John Ascott and Sarah Shilston. When he was seven, a disaster overwhelmed his family. In one week, in June 1732, two of his brothers were buried and, four days later, his mother and baby sister. There is no evidence of a virulent epidemic affecting a number of families. The most plausible explanation may be a devastating fire, which caught hold at night while the family were asleep. We may envisage the two older boys engulfed in the flames, while the mother and baby girl escaped, only to die of burns later. If this explanation is right, then William was, like young John Wesley twenty-three years earlier, ‘a brand plucked from the burning’. In the course of a week, William’s family was reduced from seven to three. He was left with only his father and his younger brother Richard. His father married again, to Catherine Gendall, and soon two sisters and a brother were added to the family. At twenty-two, William married Mary Cox, also of Dunsford. Her surname occurs on many gravestones in the churchyard. Willliam Ascott and Mary Cox. May ye 12th. Mary ye wife of William Ascott. December ye 5th. It conjures up a heartbreaking picture of William bringing his baby daughter to church for her christening on the same day as the corpse of his young wife. Mary junior was still unmarried when she died at 36, leaving us to wonder whether she was handicapped in some way as the result of a difficult, possibly premature, birth. Like his father, William married again. MARY WEST was resident in Dunsford at the time of her marriage to William, but she does not appear to have born in the parish, nor are there records of any other Wests in Dunsford before this, other than Mary, daughter of Robert West of Broad-Clyst, who married Thomas Reddaway there in 1711, and the marriage of John West to Amey Elliott in 1748. The most likely baptism so far found for Mary is in the neighbouring parish of Holcombe Burnell, north-east of Dunsford. 1726 Maria filia Johannis West et Gracia Uxoris Ejus batiz: erat Ultimo die Maÿ. If this is the correct identification, then Mary was one of the eldest in a large family. By the time of her marriage, she was resident in Dunsford. They raised a family there. This is the first instance of the spelling ‘Arscott’, and it does not become the standard form until near the end of William’s life. William Arscott was a literate man. In 1755 he witnessed the marriage of John Coldrige, Husbandman, and Elizabeth Townsend, in Dunsford. The bride and groom were illiterate, but William signed his name with a stylish hand, including a long ƒ for s. Unfortunately, William’s own marriages took place just before the introduction of the new-style register, which required signatures and gave more information about the couples. Another daughter was baptised in Doddiscombleigh, further down the Teign valley. 1764 Sarah Daughter of Wm & Mary Arscott of Dunsford was Baptized. April 12th. The family were evidently still resident in the parish of Dunsford. 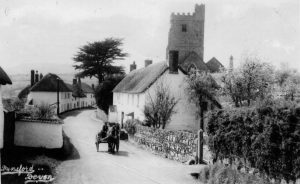 They probably used the Doddiscombleigh church because it was then nearer to them than the one in Dunsford village. Examination of the parish boundaries suggests that their home was on the east side of the Teign, somewhat to the north of Bridford Bridge. Much of Dunsford was in the hands of the Fulford family. The rent books of Great Fulford show the names of tenants of several manors in and around Dunsford. No Arscotts are listed. They appear not to have been Fulford tenants and may have owned their own home. No other children were baptised in Doddiscombleigh, but Sarah was married there, as a resident of that parish, in 1785. Mary and William appear to have stayed on in Dunsford, with William’s unmarried daughter Mary from his first marriage. All three were buried there. Mary was 49 when she died, and William 57. It was probably their son William who married Elizabeth Sercombe in Dunsford in December of that year. This William Arscott was said to be of Doddicombsleigh. Both he and his bride signed their names in neat handwriting, showing that this son was given an education, though his sister Sarah was illiterate when she married. There appear to have been two William Arscotts in Doddiscombleigh at this time. The other one was a mason. Mary, possibly the unmarried daughter of William senior’s first marriage, died two years later. That same year, a younger William died too. Since he was buried in Dunsford, not Doddiscombleigh, this was probably William and Mary’s son. His widow Elizabeth married John Kelly of Tedburn St Mary in 1790.